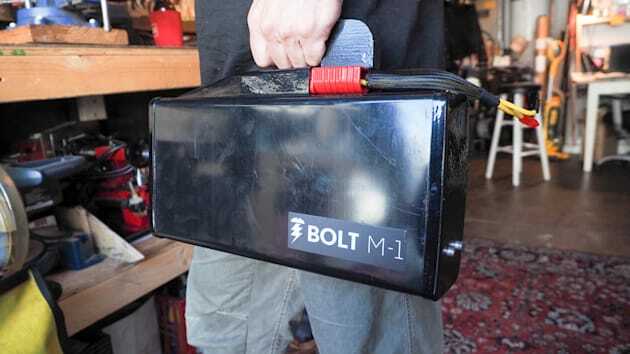 The Bolt looks sort of like a motorcycle, but it's really more like a BMX bike with an electric motor bolted to it. The startup's electric bike doesn't try to compete with motorcycle maker Zero or scooter manufacturer Gogoro; instead it's targeting the bicycle commuter that wants a smoother ride to work. While it also looks like a cross between a moped and cafe racer, it's technically a bicycle with an electric motor and can technically be ridden in the bicycle lane. Angry cyclists aside, that also means you don't need a license to ride it or a have to get it registered or insured. For urban environmentalists tired of showing up to work all sweaty, it could be the ultimate commuter. The Bolt M-1 is fun to ride. You just get on, twist the throttle and you're off. Not off like a shot. It's not a motorcycle -- far from it -- but its electric engine is zippy enough to pleasantly surprise you the first time you open the throttle. The 140-pound frame and pedals remind you that you're on something closer to a bicycle than a motorcycle. But it's heavy enough that those pedals should only be used on flat surfaces or while pointed downhill. Or better yet, not at all. You can ride the M-1 like a bike, but it's not ideal. Even though I was riding a pre-production version of the bike (code-named: Raven), it's sturdy enough to be jumped over speed bumps (something co-founder Nathan Jauvtis was happy to demonstrate during my initial test ride with him) and has a sufficiently sporty look so that it doesn't seem like a standard moped. It's cool looking enough to get the attention of the Engadget staff when I rolled it into the office. Did I mention it's technically a bike? It has the expected technical touches you would expect from a Silicon Valley startup. It uses a passcode instead of a key and has a USB charger for your smartphone and a companion app that connects via Bluetooth. Two quick-release batteries sit at the top of the frame like a motorcycle gas tank. The batteries can be removed and charged in your home or at work. Jauvtis noted that not everyone has a garage to charge their vehicle. This way you can lock up the M-1 and charge its batteries without connecting the bike to a wall. The bike has two settings: Eco mode with a top speed of 20MPH pushing 1,000 watts with a 50-mile range and Sport mode with a top speed of 40MPH with a 30-mile range pushing 5,500 watts. While you would be tempted to buzz around town in Sport mode, legally you shouldn't. Bolt notes that it's for "off-road use only." That's because once the bike is out of Eco mode, it's technically not an electric bike anymore and is subject to registration and the rider needs a license. So owners should never ride on the streets in Sport mode (wink wink). Of course if you do, and you're a fan of obeying the letter of the law, Bolt will help you register the vehicle as a "special construction" (like a custom motorcycle) with the DMV. That is, when the bike is available to the general public. Bolt is currently accepting $500 deposits to be part of the initial production of the bike. The deposit will secure potential buyers a spot in the crowdfunding campaign it will launch in September. The first bikes will cost $4,995 with normal pricing landing somewhere between $5,500 and $6,000. It's not cheap. The first generation of any product rarely is. In the meantime, the Bolt team is hand building 10 bikes for beta testers out of a garage and a living room in San Francisco's Richmond district. Jauvtis is excited. The Bolt M-1 offers scooter and moped convenience without the licensing and registration barriers associated with those vehicles. The bonus is that it's fun to ride and easy on the eyes.